So I followed some of the liveblogging for the Apple announcements earlier today, with the Apple iPhone 5 being the headline announcement. I hope to later go back and watch the video webcast, as much interested in the theater of it as the details. Overall, I walked away with the impression that it was a relatively impressive update from the iPhone 4, but I wasn’t convinced it was enough to compel people to upgrade. I mentioned in a post a while back I’ve gone native, now using a “dumb phone” (an LG), because I had left AT&T, toyed with an Android on Virgin Mobile, before deciding on the LG dumb phone primarily for phone usage. I still have my iPhone 4, which I use sometime for checking email and calendar, and reading or watching a movie on plane rides, but because I’m not as mobile as I used to be (not traveling as much), I didn’t feel compelled to need a smartphone. Back to the 5. I didn’t see a compelling reason to upgrade with the new features — the bigger 4″ screen, the thinner form factor, LTE support, the new camera (including the admittedly cool panorama mode). But just for grins, I clicked on the Apple application that let me checked what it would cost to go ahead and upgrade ahead of my current pre-rebate date (the date for which I could upgrade with the device actually being subsidized by Verizon). 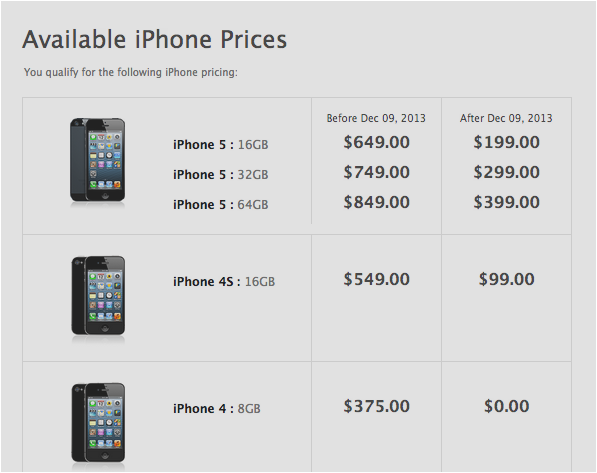 I couldn’t get into a 5 for less than $649 until December 9, 2013…by that time, I suspect there will be an iPhone 6. Even jumping back to the 4 would cost me $375!!! And therein lies my distaste with the current mobile phone economics in these United States. Hey, if I was traveling all the time and depending on those services the iPhone could offer remotely, I would consider it. But recognizing I have other devices (the iPhone 4 using wi-fi, an Android tablet AND an iPad), no way, no how. I suspect many Apple fan boys and girls will pay the pre-rebate price, and more power to them. But my money would be better invested in a new mini iPad (apparently coming in October) or even the new iPod Touches also announced today. But if you get an iPhone 5, be sure to give me a demo the next time you see me.